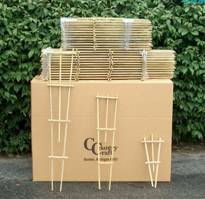 Country Craft is a family owned and run manufacturing company that specializes in trellises and other garden accessories. We have a decorative line of trellises, planter boxes and miscellaneous garden essentials for the everyday home owner. Popular with greenhouses throughout the United States our Grower Trellis product line not only serves to keep the vines contained during the growing stages, but also makes an excellent merchandise presentation. Garden Centers, nurseries and greenhouses have found that our display racks come in handy at keeping track of inventory and helping to save space. All Country Craft trellis and garden products are made out of pressure treated southern yellow pine. These products never need painting, but can be stained to enhance the natural beauty of the wood. Country Craft has developed a variety of display racks to assist the retailer in product presentation and free up valuable floor space. Our racks provide an attractive easily accessible display for our trellis line. Besides attracting customers with a prominent display the racks also allow retailers to easily keep track of inventory. Our racks are shipped fully stocked with the appropriate trellises and ready to be placed on the selling floor. For an eye catching trellis display contact us for sizes and prices. Check out our new Space Saving racks designed with the retailer in mind to use minimal valuable retail floor space. 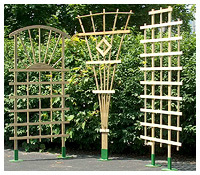 Country Craft also offers a distinctive line of trellises designed specifically with the grower in mind. The unusual product line is extremely popular with greenhouse owners through out the United States. Glued, stapled and manufactured from pressure treated yellow pine, the Country Craft Growers Series is available in Standard 1', 2’ and 3’ heights. Additional sizes are available along with custom made sizes to fit the specific needs of different growers. This competitively priced product line can be used by growers of any size. Samples are available upon request. Our grower line trellises not only serve to keep the vines contained during the growing stages, but also make a nice presentation. Custom trellis design services are also available.